Nobel Prize-winning German novelist and critic Günter Grass died at his home on April 13. 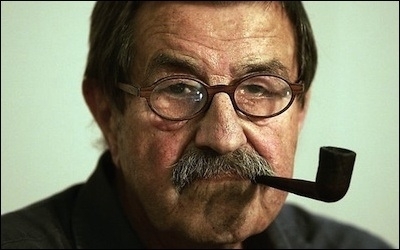 Günter Grass, one of postwar West Germany's most prominent novelists, died at the age of 87 on April 13th. On the basis of his 1950s novels, The Tin Drum and Dog Years, he saw himself and was seen by many others as a probing conscience of the Federal Republic, one who urged a forgetful society to look directly at the Nazi past and its crimes. Then in 2006, the intellectual who specialized in making moral judgments about others revealed that he had concealed his membership in the Waffen SS. His standing as a moral judge of the postwar Germans collapsed. As became evident in 2012, Grass was not deterred from expressing his antagonism towards Israel. 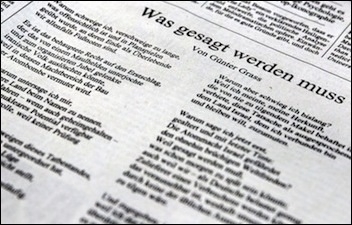 As readers may recall, it was then that the Süddeutsche Zeitung, a liberal Munich newspaper, published Grass' diatribe — in the form of a poem — entitled "What must be said." He warned of a possible Israeli "right to a first strike which could extinguish the Iranian people," one that could be carried out with submarines delivered by Germany to Israel. Grass's 2012 poem, entitled "What Must Be Said," reads in part, "Israel's nuclear power is endangering/Our already fragile world peace." Grass's "poem" met with a withering critical response from German journalists and intellectuals including Henryk Broder, Richard Herzinger, Josef Joffe, Malte Lehming, Franz Schirrmacher and Clemens Wergin. In her memorable speech to the Knesset in 2008, Chancellor Angela Merkel stressed the close bonds between the Federal Republic of Germany and Israel and insisted that Iran must not acquire nuclear weapons. That has remained the German government's official position. Yet, as the German political scientist Matthias Kuentzel has written, economic pressures in Germany in favor of détente and relaxation of sanctions are considerable. Kuentzel's Germany and Iran: From the Aryan Axis to the Nuclear Threshold examines the cultural, political and economic connections between Germany and Iran in the past and present. He is one of those German intellectuals who, like a younger Grass, cast an unwavering gaze at the crimes of the Nazi past but unlike the Grass of 2012, cast that same unwavering gaze at the radical anti-Semitism and ideological drive of the Islamic Republic of Iran. Now that the Iranian leaders are declaring that their military bases are off limits for inspections and that sanctions should be lifted immediately if a nuclear deal is signed, it is a particularly good time to take a look at Kuentzel's interpretation of Germany's stance towards Iran.